When it comes to living a long life, Italy is the place to be. The high-heeled boot surrounded by five seas is ranked the healthiest country on Earth in the Bloomberg Global Health Index of 163 countries. A baby born in Italy can expect to live to be an octogenarian. But 2,800 miles south in Sierra Leone, the average newborn will die by 52. While Italy is among the most developed countries, growth has stagnated for decades, almost 40 percent of its youngsters are out of jobs and it’s saddled with one of the world’s highest debt loads relative to the size of its economy. Yet Italians are in way better shape than Americans, Canadians and Brits, who all suffer from higher blood pressure and cholesterol and poorer mental health. Then there is the diet, rich in vegetables and drizzled with extra virgin olive oil. Adam Drewnowski, director of the Center for Public Health Nutrition at the University of Washington, has written about the importance of consumers having access to fresh produce, fruit, lean meats and fish. Each country in the index was graded based on variables such as life expectancy, causes of death and health risks ranging from high blood pressure and tobacco use to malnutrition and the availability of clean water. 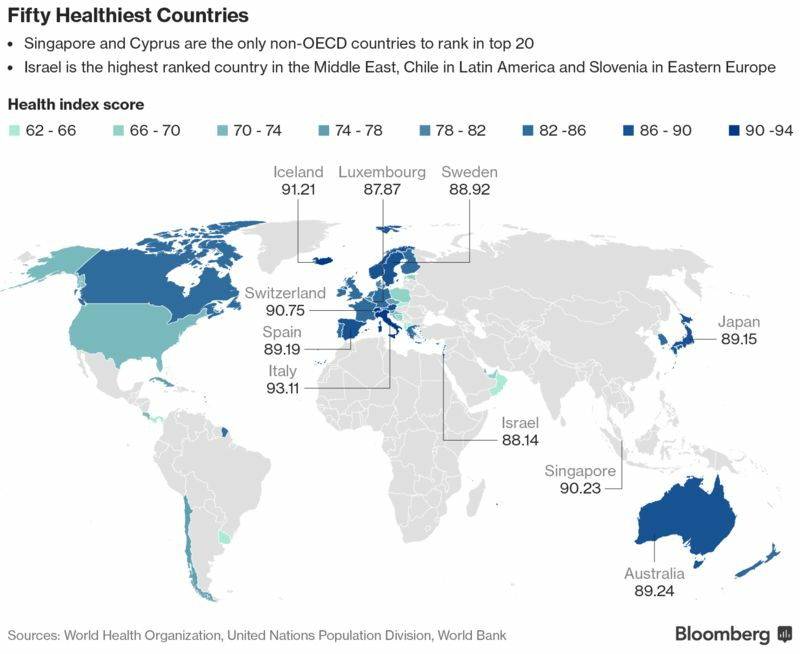 Iceland, Switzerland, Singapore and Australia rounded out the top five most-healthy countries in the index. The developed world isn’t without its risks — obesity among them. The U.S. placed No. 34 with a health grade of 73.05 out of 100. It's ranking for prevalence of overweight people is 67.3 — tipping the scale as one of the world’s heaviest nations. The poorest states — Louisiana, Mississippi, Alabama and West Virginia — are heaviest with more than 35 percent of their populations considered obese, according to U.S. Centers for Disease Control.